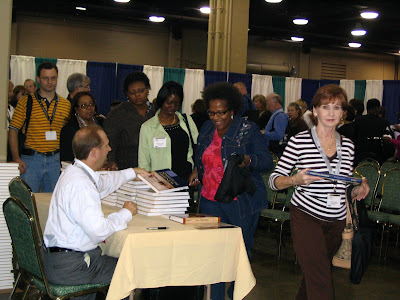 Dr. Robert Kellemen (seated) was one of three BMH authors who made presentations and autographed copies of their BMH books at the American Association of Christian Counselors (AACC) convention last week at the Opryland Hotel in Nashville. Kellemen, a Grace Seminary alumnus who is chair of the counseling education department at Capital Bible Seminary, is the author of Spiritual Friends and Soul Physicians. He autographed Spiritual Friends, a psychology workbook, at the convention. Soul Physicians, a 590-page hardback textbook combining theology and psychology, is currently at press and will be available about mid-October. Also presenting and signing autographs were Grace College & Seminary faculty members Roger Peugh and Tammy Schultz, authors of Transformed in His Presence: The Need for Prayer in Counseling.